The criteria was strict and the decision was difficult to make but here they are, the ten best environment websites in the world. ❶ Alternative Energy News – This web site has always been a favorite of mine when looking for news about alternative and renewable energies. I have had the pleasure of meeting its founder and webmaster Alex Ramon. He’s dedicated and passionate about all things environmental, and lucky for us he started this website a couple of years ago. Incorporating up-to-date videos and well written articles, Alternative Energy recently integrated its sister site, Energy Planet, a renewable energy directory, into the mix. Alex has also created a search engine focusing on the environment. Alternative Energy is, and will continue be, the leader in environment news. This makes Alternative Energy News the best environment website in the world. Congratulations, Alex! ❷ PESWiki – This great website focuses on renewable energy solutions, and it is community-built. The “Wiki” phenomenon has not left out the environment as illustrated by PESWiki. Being entirely driven by people who have a zeal for the environment, only the best and most relevant articles and information is presented. At this site, all of us have the opportunity to help increase the awareness of, and to learn about, the environment. Everyone has an opportunity to add their two cents and present information that they feel is vital to saving our planet. This is a site that is growing at a very fast pace and in my opinion they have only scratched the surface as to what it can offer, and what it could mean to the environmental community. ❸ Live Science – Easy to read, entertaining, and fact driven are just a few of the reasons that I have Live Science rated as the third best environment website in the world. It reminds me of National Geographic, but with more text to go along with beautiful photography. Definitely a website for both the serious and the arm chair environmentalist. One beef I do have is that I saw an advertisement for British Petroleum. That aside, this is an excellent site. ❹ About My Planet – A web community devoted to the environment, About My Planet has very well written articles by a number of knowledgeable people. Consistently updated and beautifully designed with a wonderful balance of inviting images and text, this is a website that stands head and shoulders above many others. A recent addition to About My Planet is a service called Grow. Entirely based on stories from it readers, Grow creates wonderful and intelligent dialogue from its users. About My Planet has done it right and I am a regular visitor. ❺ BusinessGreen.com – Based in the UK, this is a blog filled with well written articles by author James Murray. Geared towards readers interested in green and sustainable businesses, BusinessGreen blog offers its readers a well thought-out perspective in this fast-growing area of the world’s economy. ❻ Meet the Greens – This site keeps the kids in mind. Smartly focusing on educating our children in a fun way about the environment, this site is highly interactive. Using animation and other highly visual techniques to keep its readers attention, Meet the Greens is a website for all ages. ❼ National Geographic – Yes, the one and only National Geographic. Their main site is wonderful, but don’t forget to go to the link titled environment. Beautifully laid out, like the magazine, their online version is full of stunning pictures. Their writing team is pumping out some top quality articles at the site, adding to its overall appeal. It is obvious that the transition that the magazine made to the current online version was a successful one. ❽ Digg – Many people aren’t even aware that Digg has an area at its site devoted entirely to the environment. With thousands of articles in its archives, it is a great tool to browse for your own enjoyment, or to do some serious research. ❾ Inside Greentech – A website full of articles and up to date news about green technology. Growing in leaps and bounds over the past few months this is a website that could easily crack the top five in a year or two. 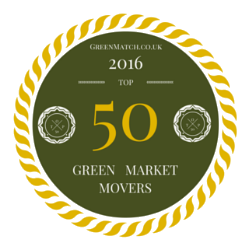 10 Green Business – I couldn’t make a list of the ten best environment websites and not put Green Business on it. We offer articles and news about businesses that focus on keeping the planet livable – hopefully for generations! Some articles will be serious, while others will be more light-hearted. The one thing in common is that they will be written with my love of our planet in mind. ☀ There you have it, the ten best environment websites in the world. As the internet grows, as well as our consciousness about our fragile planet, new and exciting environmental resources will emerge. These resources will provide two fundamental things, they will both educate and offer us hope for a fantastic future.